Everyone deserves a great love story. But for seventeen-year-old Simon Spier it’s a little more complicated: he’s yet to tell his family or friends he’s gay and he doesn’t actually know the identity of the anonymous classmate he’s fallen for online. Resolving both issues proves hilarious, terrifying and life-changing. Directed by Greg Berlanti (Riverdale, The Flash), written by Isaac Aptaker & Elizabeth Berger (This is Us), and based on Becky Albertalli’s acclaimed novel, LOVE, SIMON is a funny and heartfelt coming-of-age story about the thrilling ride of finding yourself and falling in love. 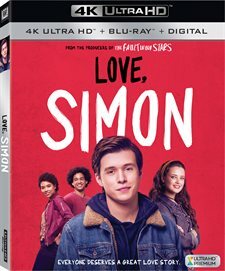 Download Love, Simon in Digital HD from the iTunes store. Love, Simon images are © 20th Century Fox. All Rights Reserved. High school is a time of change and growth for so many young people. Ask most adults and they will tell you it is the best and worst time of their young lives. No longer a child but not yet an adult, it can be confusing and strange experience for anyone. Imagine how much harder it must be when you can't be your true, authentic self and have to hide a secret from everyone even your closest friends and family. Even In today's day and age of inclusion and acceptance it is still hard for a young adult to identify as part of the LGTBQ community and Love, Simon shows this struggle in detail. 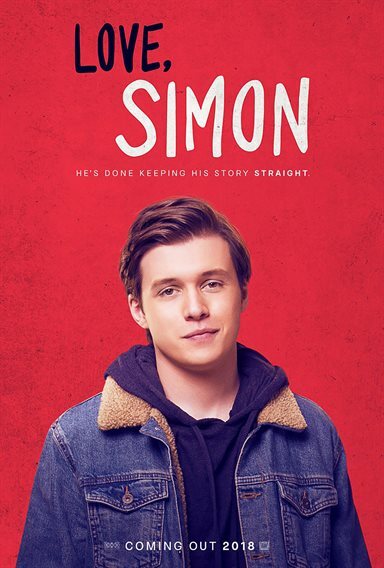 Based on the young adult novel by Becky Albertalli, Love, Simon chronicles the story of Simon Spier (Nick Robinson; Everything, Everything), a typical high school teenager who happens to be a closeted gay young man. When another student anonymously announces on the unofficial school chat website that he is gay Simon reaches out under a pseudonym and they begin a dialogue that turns into a friendship (or maybe more). Everything is going well until one day Simon accidentally leaves his email open on a school computer and fellow student Martin (Logan Miller; Before I Fall) finds Simon's correspondence. Martin then uses the emails to blackmail Simon into helping him win over Simon's friend Abby (Alexandra Shipp; X-Men: Apocalypse) who doesn't like Martin at all. As Simon plots to help Martin he digs himself into a deep hole that includes manipulating his best friends Leah (Katherine Langford; 13 Reasons Why) and Nick (Jorge Lendeborg Jr.; Spider-Man: Homecoming). When Abby publicly rejects Martin he posts Simon's emails in order to deflect attention away from himself. Suddenly outed, Simon loses Blue/Bram (Keiynan Lonsdale; The Flash), the other closeted student, as well as his 3 best friends who realize they were used and tricked. Living his new truth, Simon suddenly feels alone and rejected for the first time in his life despite love and support from his parents and sister. Good material generally attracts good actors and this is certainly the case with Love, Simon. Robinson is perfect as Simon. The range of emotions that cross his face as he struggles with his secret makes the viewer feel his pain, fear and confusion as well as his love for someone he doesn't really know. Robinson, Shipp, Langford and Lendeborg have great chemistry which makes their friendship believable and helps to solidify the storyline. Jennifer Garner (13 Going On 30) and Josh Duhamel (Transformers) as Simon's parents do an excellent job in their smaller roles. The 4K Blu-ray 2160p resolution is solid here with vibrant colors and clear picture quality. The lush greens of the Atlanta suburb are showcased nicely in contract to the stark hallways of the high school scenes. The DTS-HD Master Audio 5.1 is clean and showcases the eclectic soundtrack well. The dialogue is solid and crisp but a note of forewarning: the music on the menu has been boosted so turn down your speakers before you play the movie or you may blow them out with the base from the soundtrack. Once you hit play you will need to turn the volume up again to hear the dialogue. The Combo pack includes the 4K, regular Blu-ray and the digital download. There are also a few extras housed on the Blu-ray disc including Deleted Scenes, The Adaptation, The Squad, #FirstLoveStory Contest, Dear Georgia, Dear Atlanta, Gallery and Theatrical Trailers. The best of the grouping are the Adaptation, the Squad and #firstlovestory contest winner though none really immerse the viewer into the story more than the film itself does. I felt Simon's anxiety, fear and pain and I wanted to reach through the screen and give him a hug. I can't imagine what it is like in today's world to be a LGTBQ teen let alone what it must have been like back when I was a teenager and tolerance was something not taught in schools. This film should be required of every student in every high school across the country and then perhaps we will become a more understanding and loving country. This is the best romance movie ever!!! !